Reminisce the days you were a young kid waiting for those glorious summer days at camp with friends. Everyday was a new adventure, filled with activities, swimming and socializing. Now you’re all grown up, with responsibilities, a job, and maybe a family, so that leaves you with little time to take a break. Club Getaway is your safe haven from the haste in your life. Tucked away in the countryside of Connecticut lies the small town of Kent, where Club Getaway occupies 300 delightful acres of lush green pastures, overlooking the Berkshire Mountains. A luxury bus and chaperone will meet you in the Heart of Manhattan and whisk you away from all the hustle and bustle of the city, to the quaint, lakeside campsite. Upon arrival, you will be provided with room keys and the Club Getaway wristbands, which involves a bright pink one that grants unlimited alcohol all weekend long. After you freshen up and check out your room, a buffet dinner comprised of gourmet comfort fare will await your arrival in the dining room. After dinner, camp volunteers will lead you to the roadhouse, which turns into a nightclub after hours so you can dance the night away with laser lights flashing past you and smoke machines filling up the room with an eerie mystique. A karaoke machine is also available, for those feeling bold or drank a little too much. Make sure to get plenty of rest, because during the day, the campground becomes an adult playground for you to partake in as many activities as your heart desires. Before you venture off, take advantage of the bountiful breakfast buffet. Channel your inner adrenaline junkie with the zip line that will have you flying through a forest, or conquer your fear of heights at the Aerial Park, which will have you tackling a challenging rope course in mid air. If you’re searching for a stomach dropper, try the Geronimo Drop or take a leap of faith on the bungee trampoline. Other activities include mountain bikes, archery, kayaking, baseball and much more. Group activities are the best way to socialize with fellow campers, and Club Getaway prepares some of the traditional games, but with a twist. Campers can expect to slip n’ slide in kickball, instead of running and the color war tournament, is the perfect team building exercise, which is guaranteed to expose your competitive side. Patrons will choose a team, gear up and prepare themselves for a variety of games including inflatable horse races, hula-hoop relays and water balloon tosses—this will be sure to pinch those childhood memories of yours. To try something a little different, join your fellow peers for a cosmo hike led by entertainment director and man of many costumes, Bluto. The camp volunteers will guide you through the park with cosmos in hand. If you’re looking to lay low, there are plenty of opportunities to kickback and relax by the water. The lounge chairs by the lake are the ideal way to soak up the sun, or if you feel up to it, swim out to the waterpark and climb up onto one of the floats they have and just sprawl out. Sign up for a round of bloody Mary bingo or a scandalous game of Cards Against Humanity at the boathouse. The last night will have campers dancing in masquerade fueled by fun themed cocktails at the Alice in Wonderland Party. After a buffet dinner with live entertainment, diners will be lead by fire to the infamous Rabbit Hole (aka boathouse) where Alice awaits to welcome you in with her teapot, filled with punch—the adult kind. The entire space epitomizes the Mad Hatter’s Tea Party led by the Queen with potent teapot filled elixirs and playing cards scattered throughout to highlight the theme. The best part about Club Getaway is campers can pick and choose their weekend experience. For instance Club Getaway hosts Camp Out LGBTQ weekends, Young Professionals and Generation X weekends, which all come with their own large package of adventure and entertainment. By the end of the week you will have conquered your fear of heights, tasted adrenaline at the zip line, relaxed by the water and let loose at the extravagant parties, and maybe even made a new best friend along the way. 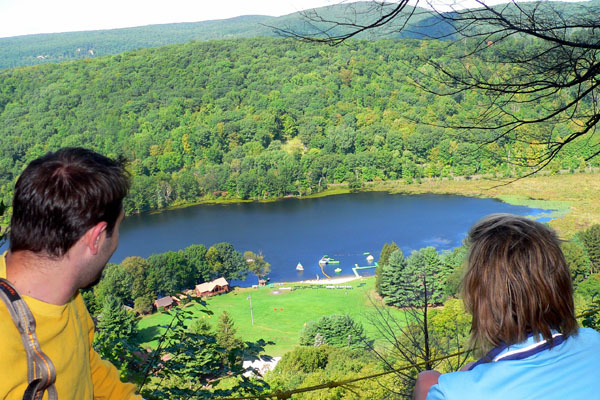 Club Getaway provides New Yorkers with an escape from the city, a chance to reconnect with nature and the opportunity to rediscover summer camp life once more.